Ultimate Globes Blog: Need to Add Character to a Room? Consider a Floor Globe. Need to Add Character to a Room? Consider a Floor Globe. An example of a floor globe. Do you have a corner in your home or office that’s bare and in need of a breath of fresh air? You’ve tried a lamp, a plant, a shelf, and even a painting, but all these don’t seem to spruce up the room in the way that you want. Your floor lamp probably looked to lonesome, your shelf too big and bulky, and your plant might have died from lack of exposure to sunlight. Have you thought of filling up that bare area of your home or office with a floor globe? Floor globes are unique and elegant solutions that not only take up space the way you want, but add personality and culture to any room they’re placed in. Perhaps the biggest factor why floor globes make for a wonderful addition to any room is their sheer beauty. In a time where traditional maps and globes are pushed aside in favor of GPS devices and Google Maps, world floor globes still manage to carve a distinct niche thanks to their unique, analogue appeal that makes them stand out. It doesn’t hurt that floor globes are made from rich materials, which only add to their mystique. The base of a floor globe is usually made from wood and metal, while the orb itself is crafted from materials that include the more mundane plastic and acrylic, to the more exotic gemstones, silver, and gold. Each material exudes a unique, yet stunning look that gives the globe its aura. For instance, a globe crafted from acrylic allows more intricate detailing on the orb due to the materials’ properties. For a more organic and beautiful look, a globe fashioned from gemstone, either precious or semi-precious, should do the trick. Besides being great decorative pieces, floor globes also bring with them a unique functionality. With a globe, you have an educational tool to help your kids learn about geography and topography, as well as a reference tool for adults such as yourself who want to know the exact locations of continents, countries, cities and state capitals, as well as other topographic and oceanic features. 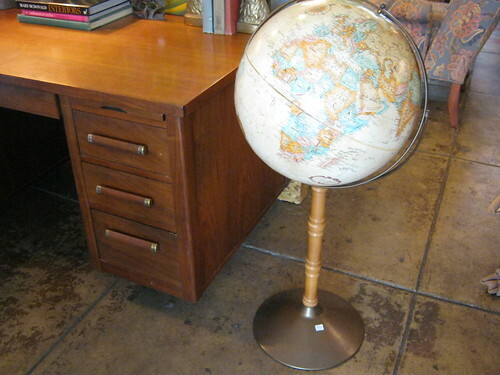 With the sheer variety of floor globes out there, you can get a globe that provides commentary on the old world (i.e. an Old World Style Globe), or a Raised Relief Globe, which lets you “feel” the bumps and crevices of elevations and depressions around the world. These are just some of the reasons to consider getting a floor globe. Shop at Ultimate Globes to get your own globe today! Can’t Get Enough of the Moon? Get a Moon Globe.